"Ah... I'm Asterius. D-don't look at me! You must think I'm a hideous beast..."
Nobody approaches! Nobody gets in! Great Isolated Fortress, Labrus Labyrinthus! I don't hate the idea of us being together! But... Wouldn't it be a problem for you? A Transient whose Sacred Artifact is a double-headed axe that crackles with lightning. Although he is born of a royal bloodline, his own father sent him off to live in a dark, lonely place within an abandoned palace because of his unusual appearance. After leaving that palace, he continues to avoid other people, preferring the labyrinthine mountain forest to the crowded streets of the city proper. A visitor from another world wielding a twin bladed axe enchanted with lightning. Although he was born to a noble family, he was an outcast by his father's hand. Shunned for his appearance, Asterius was sealed away in darkness all alone. Even now, having crossed worlds and living in Tokyo; he lives in self-imposed isolation in the mountainous backwoods, in a labryinth of trees and foliage. He is, on occasion, unable to reign in his overflowing emotions and unleashes his brutal strength. However, when he does, he regrets it. He believes that someone as ugly as him will never be loved and because of his timidness and fear of hurting others, he chooses to be alone. His Rule has the ability to reject all interference. He has the tendency to dislike people who are pushy as to how others should act. At times he is overwhelmed by bursts of emotion and rages with the ferocity of a storm. But each time he is tormented by equally fierce regret. Asterius chooses loneliness believing a beast like himself should never be close to anyone, as the sorrow of harming them would be too heavy to bear. Fri...ends? With me? If you're joking it's not funny...! A deserted island like this is where I belong...! I-I won't let anyone pick on my friend! Leave my friend alone! Obstructed Giant Bated Breath, Labrus Labyrinthus!! Damnit... Even now... am I still... alone...? This Transient was beckoned by a call which caused him to drift away to a mysterious, deserted island... still clad in his swimsuit. Born a monstrosity, he was abandoned by his father and imprisoned in a labyrinth on a deserted island. He believed his ugliness is the reason he has never been gifted with a father's love and remained ashamed of his looks. He stayed out of sight, withdrawing into the familiarity of his dark cave. Once told that he was needed, for the first time in his life, he decided of his own volition to leave the labyrinth at last. He cares deeply for those who act fatherly towards others and those who work to guide children to the right path. A Summon who was called by someone's voice, drifting in to a certain mysterious solitary island while wearing a swimsuit. Because of his grotesque appearance by birth, he was sealed within a labyrinth in a lonely island and has never known paternal love. Due to that he is ashamed of his "unsightly" appearance, and as he is unaccustomed to public attention he has secluded himself at the bottom of a dark cave. However since someone came to meet him and told him they needed him, for the first time he has left the maze by his own will. He holds good will towards those who conduct themselves as fathers, especially those who endeavor to guide children by their own hands. 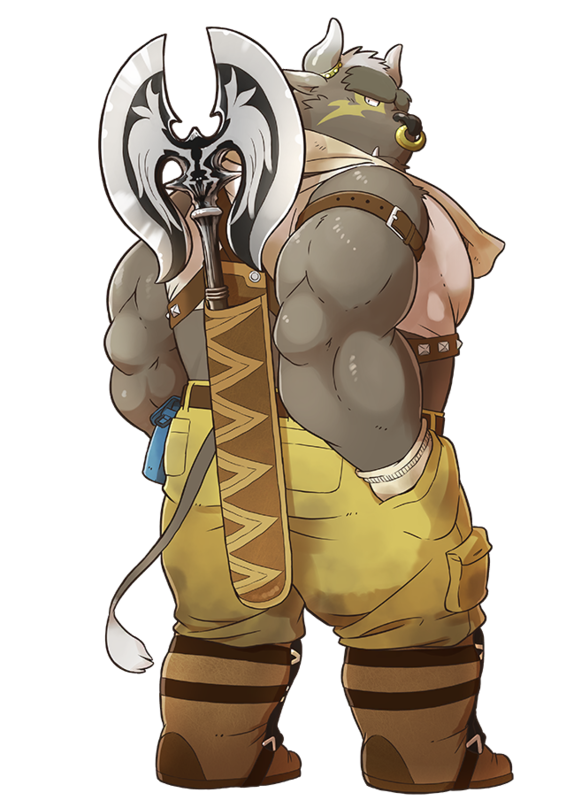 Asterius' Charge Skill and nature as an abandoned man of royal blood living in isolation stem from the Greek Myth of Theseus and the Minotaur. In some versions of the story, the minotaur is never named, while others note his name as Asterius. What is a good setup for using him? "I just wanted to live a quiet life..."
This one must be a huge fan of Yoshikage Kira. I want to take this poor guy out for a latte. This page was last edited on 16 December 2018, at 21:07.